Bullying is something we absolutely abhor at Tears of Crimson, but not sure we'd take our revenge as far as the call out Charlie Sheen gave March 14th. 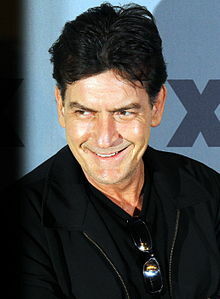 According to TwitLonger Sheen, encouraged his twitter fans to use dog poop, rotten eggs, and toilet paper on the school where his daughter was supposedly bullied. Even us hot tempered folks in the South, might try some less abrasive ways before resulting to those ideas. We support Sheen's right to be angry if he feels his daughter is being bullied, and even understand the rage that could make someone angry enough to put out request like that, but obviously we can't condone the behavior. Several people we've talked to have similar issues with their own children and can probably admit to wanting to do something as drastic as a "call to doggy poop arms", but the truth of the matter is, violence doesn't stop the problem, even if it's just messy, stinky, violence. Schools need better plans on dealing with the issue of bullying. Support groups for the kids suffering it, and stronger laws against parents who can't control their children from these harmful acts. We at Tears of Crimson believe there should be anti-bullying groups at every school and encouragement to all the students to participate in classes that show the long-term effects to this form of harassment. So while we understand Sheen's frustration, we also see a chance for something positive to come from having a celebrities child put in the same circumstances that children suffer through everyday at local schools. Our heart is with his daughter of course. JAMA Psychiatry released this report February 20, 2013 that studied the long term effects of bullies and those bullied as they moved into adult hood. "Victims and bullies/victims had elevated rates of young adult psychiatric disorders, but also elevated rates of childhood psychiatric disorders and family hardships." So it's obvious that bullying is a situation that has long term consequences. This is not something new, most of our readers probably know someone or have suffered from this harassment at some point in their lives and until people are willing to come up with stronger laws, and better programs to deal with the problem, nothing will ever change. So while we don't actually agree with Sheen's methods of handling the situation, we can definitely understand the frustration that led to the comments. You can follow Sheen on Twitter @CharlieSheen and we'll be keeping our ears open to see if anything else develops out of his call to doggie poop arms in the future. For now, we hope you have a beautiful Monday, and that the world where you live is filled with love. Angela's Salvation - Free on Kindle Today! Nome, Alaska - UFO Abductions?